DataWedge APIs operate primarily through Android intents--specific commands that can be used by other applications to control data capture without the need to directly access the underlying hardware APIs. This guide describes the functionality of the intents supported by DataWedge and their effects on data capture and DataWedge Profiles and settings. In DataWedge versions prior to 6.2, applications access DataWedge APIs by broadcasting an intent, and use the primary pieces of information in the intent (action and data) to specify which API function to perform. DataWedge 6.2 and later implement intents as extras of an action intent, permitting multiple API calls to be sent as extras using a single intent action. The use of DataWedge APIs requires experience with Java programming and familiarity with Android Intents. It also requires knowledge of DataWedge usage, features and terminology. For more information about DataWedge, see the DataWedge Setup Guide and the Architecture Overview. It also might be helpful to read the DataWedge section of the Integrator Guide included with Zebra devices. To help ensure proper execution, Zebra recommends inserting delay code prior to critical commands. See the SoftScanTrigger API for an example. DataWedge 6.3 implements the concept of nested bundles, which allows a "bundle" of values to be included as one value in another bundle. Bundles also can be multiple layers deep. For example, the image below illustrates a PARAM_LIST bundle nested within the PLUGIN_CONFIG bundle nested within the API call SET_CONFIG. Nesting is required to configure with intents the many parameters contained in a Profile. 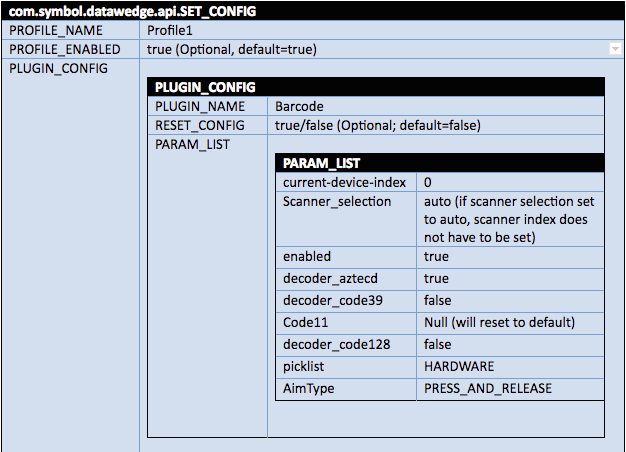 The image further illustrates that the SET_CONFIG API call can implement a second nested bundle, PLUGIN_CONFIG[n], which can contain its own PARAM_LIST. The Java code below implements a nested bundle. //Using the SET_CONFIG API and a nested bundle.